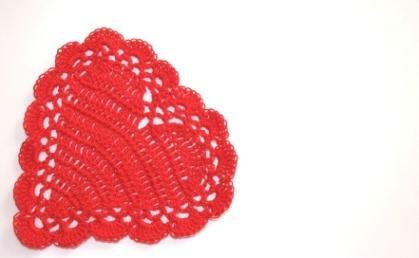 Lacy and beautiful, crocheted Valentine crafts are the perfect gifts for Valentine's Day. They are often quick projects that use up scraps of yarn. Because of this, they also are great craft ideas to sell for church bazaars, craft shows, or your online shop. When you want to make a special Valentine gift, but you find that you are in the midst of a time crunch or your budget is tight from all of the Christmas gift buying you did, a quick crocheted craft is the answer. Crocheted Valentine's earrings are a great project for beginning crocheters or people who just don't have much time. They use a minimal amount of materials and the directions are easy to follow. This Valentine bear magnet is a quick project. Once you have finished, hot glue a magnet to his back and let him hold important refrigerator artwork. This Valentine's pincushion is a great way to use up scrap yard and a quick, easy project. A simple crochet headband adds the finishing touch to a little girl's Valentine's Day outfit. This crocheted heart potholder is a sweet addition to a Valentine's kitchen. Quick enough to make for all your friends, this heart bookmark will be used for a long time. Use this small crocheted rose appliqué almost anywhere for Valentine's Day romance. The following crafts may be more intricate or use a variety of stitches and techniques. They are more challenging and best done by those crafters that have experience. Valentine's Day coasters are full of old fashioned charm. This recycled heart bag is crocheted from plastic grocery bags. This is a perfect gift for your eco-conscious Valentine. A crochet heart Valentine's Day card gives you the opportunity to create a unique card for your Valentine. This Youtube video has instructions for crocheting Valentine fortune cookies. If you put several of these heart granny squares together you will eventually have a Valentine's Day afghan. A crocheted Hershey's Kiss is a fun crocheted Valentine craft. Make giant cupcakes as well. Many Valentine's Day crochet projects are items that can be used as decorative objects throughout the year. Hearts, flowers, and even the colors fit in with many people's décor. These projects are a great way to relax and show some love.